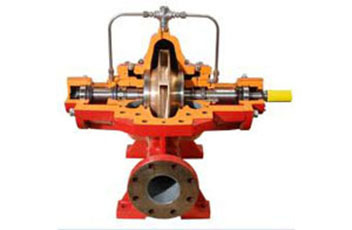 "PEW" split case pumps come with horizontal pump shaft and volute casing, which can be dismantled in the horizontal plane along the drive shaft. These pumps are available in single and double stage. The single stage pumps have inline (symmetric) design, whereas the double stage pumps have asymmetric design. The split case construction enables removal and dismantling of the internal pump parts e.g. bearings, wear rings, shaft seal and impeller without disturbing the motor & pipe work. The pumps are non self priming, horizontal split case with radial suction and discharge ports. Flanges for suction and discharge ports are PN 16 and PN 25 as per DIN standard EN 1092-2. These pumps are long coupled pumps with TEFC squirrel cage induction motors complying to IEC standards and foot mounting. 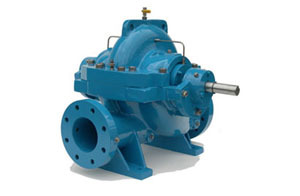 Pumps are available with gland packing as well as mechanical seal. Single-suction impeller with liquid entry from one side. 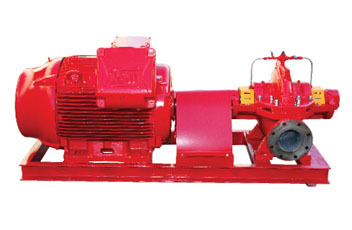 They are used in two-stage pumps only and are mounted laterally reversed in a back to back manner. Double-suction impeller with liquid entry from both sides. They are used in single stage pumps only. 2), coupling, coupling guard and fabricated steel base frame. Max permissible temp. of pumped liquid - 140℃. Max. ambient temperature - 45°C for EFF2 motors & 60°C for EFF1 motors. DOR – Clockwise as seen from pump shaft end. Pressure boosting for high rise buildings, hotels, industry etc. Industrial washing & cleaning systems. Fire Fighting systems – Hydrant, Drencher and Sprinkler pumps. Cooling & Air Conditioning systems. Boiler feed and condensate transfer system. Irrigation systems for fields including sprinkler & drip irrigation.